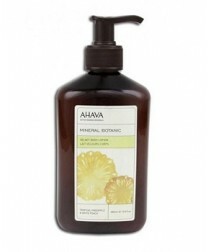 AHAVA Botanic Velvet Body Lotion Tropical. Powered by AHAVA's proprietary Osmoter™ - a balanced concentrate of Dead Sea minerals enriched with extracts of tropical pineapple and white peach. This lightly textured body lotion moisturizes, smoothes and refines the skin's texture. Smooth onto clean skin. Approved for sensitive skin. Size: 400 ml / 13.6 fl. oz. AHAVA Mineral Shampoo is a gentle shampoo has been specially formulated with AHAVA's propriety Osmoter™ to restore hydration and then enriched with Aloe Vera and Chamomile extracts to thoroughly cleanse hair and scalp. Suitable for normal hair and for daily use. Suitable for sensitive skin. Allergy tested and 'paraben' free. Size: 400 ml / 13.6 fl. oz. AHAVA Mineral Conditioner is lightweight conditioner has been specially formulated with AHAVA's propriety Osmoter™ to restore hydration and Pro-Vitamin B5, Aloe Vera and Chamomile extracts to thoroughly conditioner and soften. Suitable for normal hair and suitable for daily use. Suitable for sensitive skin. Size: 400 ml / 13.6 fl. oz. This classic AHAVA hand cream contains a rich combination of soothing natural plant extracts and oils to ensure that moisture is quickly absorbed to restore the skins natural moisture balance. Size: 150 ml / 5.1 fl. oz. This superb AHAVA foot cream has been formulated using a unique blend of natural plant extracts and oils. This soothing, creamy formulation will ensure that rough, dry and cracked feet are deeply nourished to leave them soft and hydrated. Contains active anti-bacterial agents to ensure that feet stay fresh. Size: 150 ml / 5.1 fl. oz. AHAVA Dermud Nourishing Body Cream. Treat your body skin to a light cream that takes control of the aging process! This unique blend of 21 essential Dead Sea minerals and handpicked herbal extracts will visibly brighten and clarify your skin. Size: 200 ml / 6.8 fl. oz. 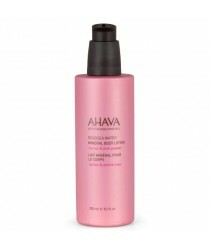 AHAVA Mineral Body Lotion a rapidly absorbed lotion protects body skin with its soothing aloe vera and hydrating Dead Sea minerals. The added witch hazel extract refreshes and revitalizes tired skin for a great feeling. Size: 250 ml / 8.5 fl. oz. This classic AHAVA hand cream contains a rich combination of soothing natural plant extracts and oils to ensure that moisture is quickly absorbed to restore the skins natural moisture balance. Size: 100 ml / 3.4 fl. oz. 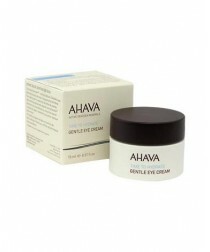 AHAVA Gentle Eye Cream special blend of Dead Sea minerals, botanical essences and skin-healthy vitamins is perfect for the delicate eye skin area. It is a rich natural formula that soothes and smoothes to provide a younger appearance. Size: 15 ml / 0.5 fl. oz. 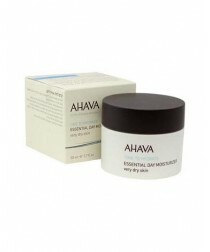 AHAVA Essential Day Moisturizer ultra-light moisturizing cream gel with Vitamin E, aloe vera extract and Provitamin B is ideal for combination skin. It increases moisture levels, improves elasticity and reduces wrinkle depth for a softer, shine-free look. For combination skin. Size: 50 ml / 1.7 fl. oz. 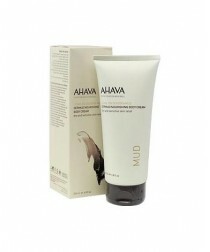 This superb AHAVA Foot Cream has been formulated using a unique blend of natural plant extracts and oils. This soothing, creamy formulation will ensure that rough, dry and cracked feet are deeply nourished to leave them soft and hydrated. Contains active anti-bacterial agents to ensure that feet stay fresh. Size: 100 ml / 3.4 fl. oz. 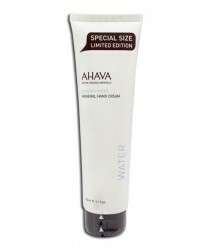 AHAVA Mineral Body Lotion. This indulging Dead Sea Water Mineral Body Lotion is permeated with a unique mix of Dead Sea minerals from the source of Dead Sea waters that provides the skin with a new smoothness, elasticity and lasting radiance. The inspiring, energetic scent of Cactus & Pink Pepper, along with lightweight hydration makes this a must have body care companion for radiant smooth skin. Size: 250 ml / 8.5 fl. oz.